Pionus are one of the best-kept secrets in the parrot world, but they appear to be gaining in popularity. They have a reputation for being "perch potatoes" but I'm not sure they deserve that rep. The pionus we know may not be quite as hyperactive as some species, but they do enjoy playing with toys, climbing (or flying) around, and hanging out with their humans. They need interaction and plenty of enrichment just like any other parrot. 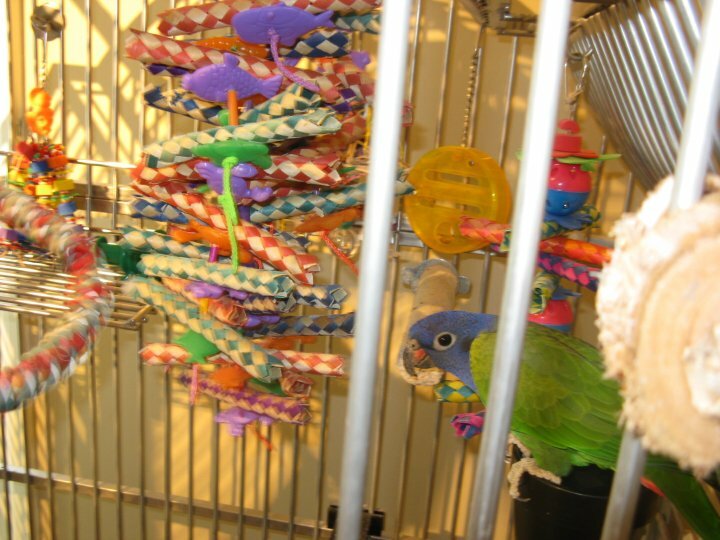 Pionus are also known for being more prone to becoming territorial about their cages, but there are some steps a Pi owner can take to reduce cage aggression. One way to avoid promoting cage aggression in any type of parrot is to give them a large cage -- the smaller the cage, the more likely a bird will become territorial about it. 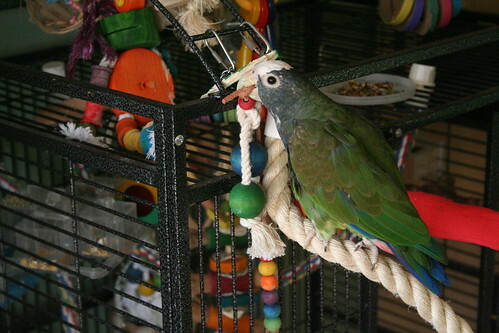 Another trick is to rearrange the interior frequently and even move the cage occasionally. 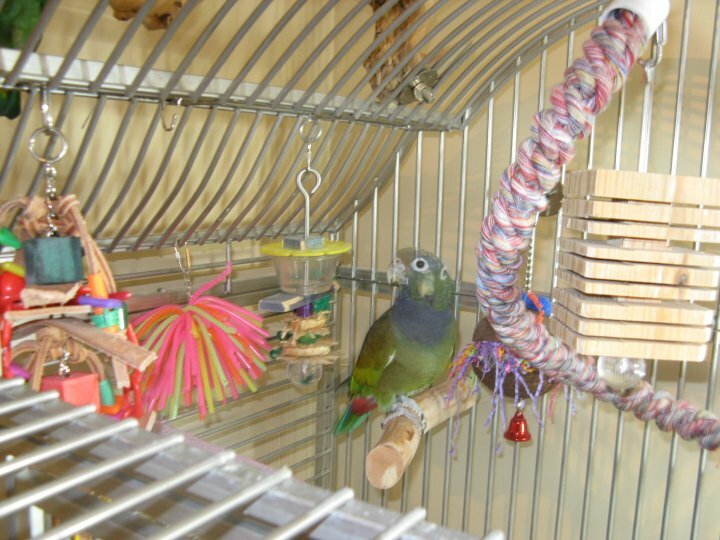 Some people see a lot of success with having a separate sleep cage for their parrots, which also reduces chances that a bird will see the main cage as a nest that needs to be defended. If all else fails and your Pionus remains cage aggressive, simply respect his space and don't provoke a bird into biting you. 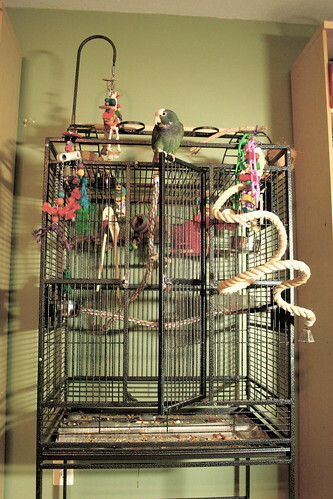 Kobe the Blue-Headed Pionus lives in a lovely stainless steel cage, made by Avian Adventures. The model is called the AA Medianna, which Avian Adventures apparently doesn't make in stainless steel anymore. Kobe's cage is situated near the action so he can feel like he's part of the flock. Accessible from the built-in playtop is a Jolly Ball and a cotton orbit for climbing and swinging from the ceiling. There is plenty of enrichment opportunity inside and outside the cage. His owner Roz says Kobe is cage territorial, so she doesn't usually ask him to step up from inside his cage. The routine is that Kobe will step onto the top perch on the door, before it swings open. He climbs on top of the cage himself. 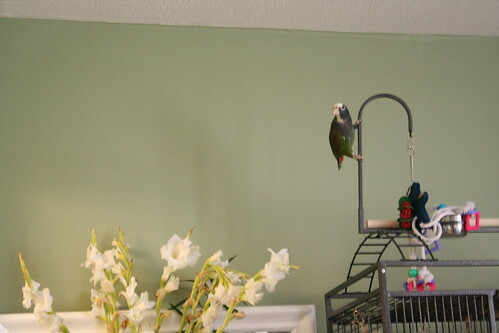 Sometimes he will step up from his door perch, but often he climbs to the top by himself; Roz will give him a minute to calm down before she goes to pick him up. This trick -- of using a small perch mounted to the inside of the door that swings out -- is common for birds who don't like hands reaching into their cages. 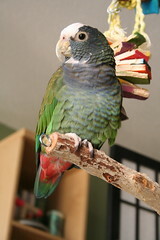 Mika is a rehomed white capped pionus (WC Pionus) who got a brand new cage when she came to her new home. 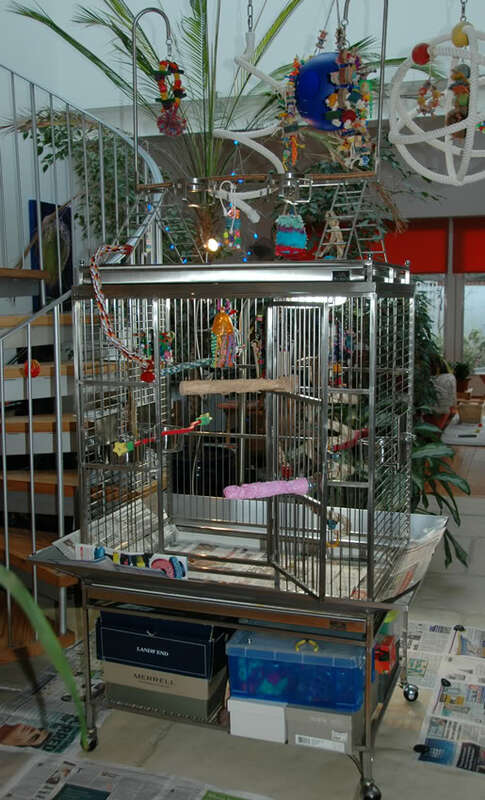 The interior of this playtop cage measures 31"x 21"x 36". The bottom grate was removed, which added an additional 6" of height to the inside of the cage. This does mean that Mika has access to the bottom of the cage, and that newspaper needs to be changed daily. Like most pionus, Mika is good at entertaining herself so she always gets access to a variety of foot toys, hanging toys and foraging toys on top of her cage. When she's not playing and exploring, Mika likes to hang out close to wherever her owner is -- so her sisal boing is usually hung on the side of the cage closest to the office desk. When she's not on the boing, she's hanging out on top of her door or on the front bar of her playtop area (never on the long dowel perch that runs across the top). Her roosting perch is also located high on the cage and in that same corner. In her cage, this pionus has two long rope perches, a pedicure perch, two bottlebrush branches and a gnarled and twisted wooden perch that offers good foot exercise. Toys get rotated on a regular basis, but she always has at least two or three foraging toys and one or two wooden toys for turning into colorful splinters. Mika's cage has been moved around the living room a few times, and as long as she's not too close to the sun conure that also lives in the same room, she's pretty comfortable wherever she happens to be. Mika occasionally likes to climb to the very highest point of her cage (the toy hook) just to get a different perspective on her world. Django the Maximillian's Pionus and Gillie the Blue-Headed Pionus each have a gorgeous stainless steel Kings Cage (Model 306). 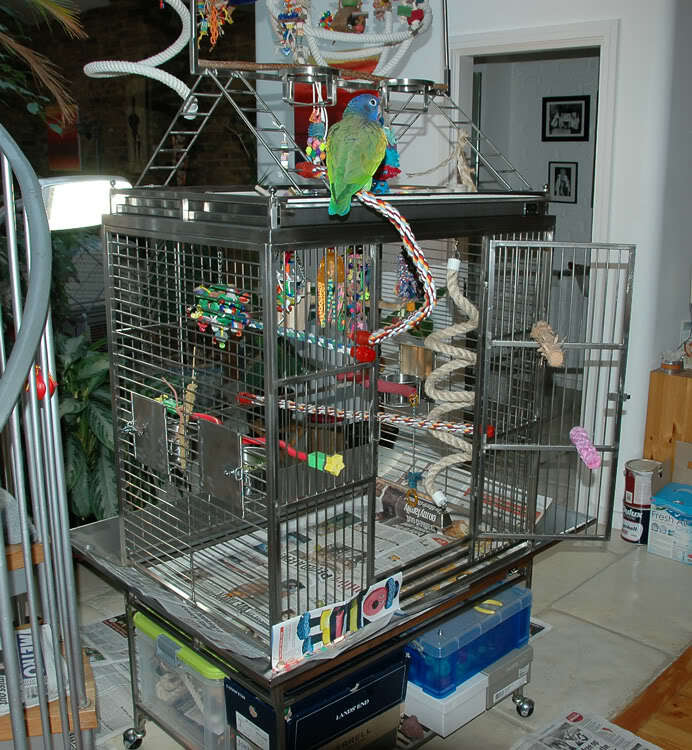 "I got the stainless steel cages ... after the double decker cage my pionus parrots were in tested at a questionable level for lead, and my senegal's power coated cage tested through the roof for zinc! It was scary! I hadn't thought I could afford ss cages before that, but it's amazing what you can justify when you are afraid your birds' cages might make them sick. " Django loves variety, so the interior of his cage is changed up often. Django and Gillie have lots of enrichment inside and outside of their cages, and they take advantage of all of it. Between the two pionus cages, Michelle keeps an air cleaner and a vaporizer. There is a second vaporizer in the room on another wall and a humidistat to try to keep the humidity around 50%. Image credits: All photos used with permission. A big thanks to the contributors. Photos of Kobe, courtesy of Roz. Photos of Mika, courtesy of Best in Flock. Photos and videos of Django, Gillie and Masti, courtesy of Michelle.